Horizon Fitness is one of the leading competitive treadmill makers. Their company excels at creating low-budget products. Their treadmills are usually less expensive than competing treadmill brands. Also offered are also ellipticals and exercise bicycles as part of the Horizon line of cardio exercise equipment. Horizon Fitness is also a part of the larger Johnson Health Tech company which gives them some credibility and consistency when developing treadmills. The treadmills are now all made with Johnson-patented drive motors, giving more consistent action to these treadmills. Horizon Fitness’ 2019 treadmill line comes in a range of prices to cater to various budgets. Each category takes a jump in features as it takes a step up in the price range. 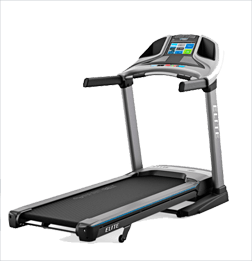 The entry-level treadmill series is the T-series. Starting in price at $599, these treadmills have up to 15% incline, 3.0 CHP Johnson drive motors, and LCD screens. The Adventure series starts at $899 with 2.5 CHP Johnson drive motors. Starting with 55” by 20” running areas, they have wide, back-lit LCD screens, and EKG handlebar grips. The Elite treadmill series is the final treadmill series for Horizon. These treadmills start at $1,199 and are Bluetooth-capable. They have 2.75-3.25 CHP Johnson drive motors, 60” by 20” running area, and over 30 workout programs. 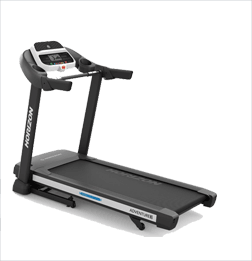 Some treadmills which we have been able to review have gone out-of-stock on both Horizon’s website as well as on the Johnson Fitness & Wellness website. However, they are still available through some third-parties online such as eBay and Amazon. 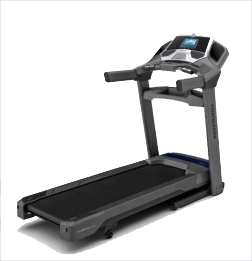 If you are curious about these older Horizon treadmills, feel free to read our reviews on them. 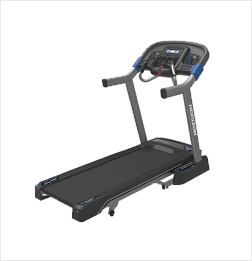 Like with all treadmill brands, it is difficult to say there is a set of common features as they vary so widely in price. Since that is the case, we have broken down the common features each of the Horizon treadmill series shares. Compact design – These treadmills are compact and fairly light, which makes them ideal for households where space is a premium. This does affect their stability when it comes to faster speeds combined with inclines. Budget treadmills – The T-series and Adventure treadmills come in at more affordable prices than competing treadmills. The T101, in particular, has received our Best Buy for the price range between $500-$700. It has an excellent ratio of features to price. Passport and ViaFit – The higher-end models from Horizon are enabled to work with both Passport and ViaFit. The Passport can sync up with your TV to allow you to run virtually in locations around the world. It must be purchased separately. ViaFit is Johnson Fitness’ health tracking app, where you can log and track your workouts. Motor size – The Horizon treadmills which we have reviewed have smaller motors than other competitors’ treadmills. There are three new Horizon treadmills for 2019, and they have larger motors. 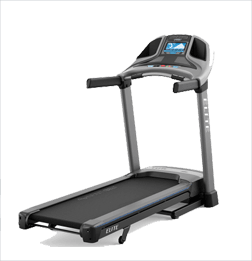 Elite prices – The Elite series can be costly without an equal trade-off in features, especially when compared to treadmills of equal price. Even when you compare the Elite T7 and the Elite T9, you will notice that there is very little difference between the two machines, yet the Elite T9 is around $400 more expensive. 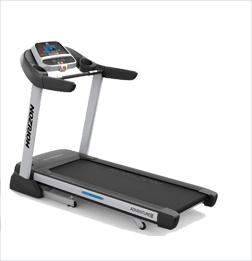 Warranty length – While the frame and motor have the lifetime warranty expected of all top brand treadmills, Horizon is not as generous with their parts and labor warranties. Both the parts and labor warranties are generally a year shorter than their competitors’ offered warranties. 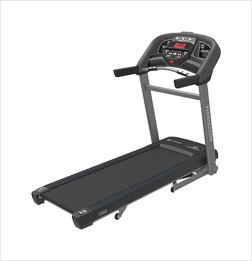 When laid out side-by-side, it is clear that Horizon treadmills lack significant upgrades that other treadmill brands have as the Horizon treadmills increase in price. We encourage you to learn more about Horizon’s specific treadmills by reading their individual reviews. 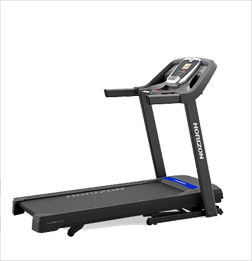 When laid out side-by-side, it is clear that Horizon treadmills lack significant upgrades that other treadmill brands have as they increase in price. We encourage you to learn more about Horizon’s specific treadmills by reading their individual reviews.